The commercialisation of university-based research can contribute to economic development, according to University of Ulster research. 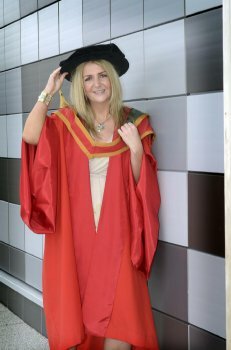 Kristel Miller, who was awarded a doctorate at the Ulster's summer graduation ceremonies at Magee, investigated how academic research could be successfully transferred to industry for her PhD thesis. A past pupil of St. Patrick's and St Brigid's College, Claudy and Thornhill College, Derry, Kristel, who is from Slaughtmanus, County Derry,graduated with first class honours in Business Studies with Computing and MSc in Business and Information Innovation with Distinction. After completing her MSc degree, Kristel was employed as Quality Manager with Rutledge Joblink in Coleraine. She said working in industry made her realise the importance of research and its implications for managers and decision makers. Her PhD research explored how university research could be shared between multiple stakeholders. She continued: "The research has relevance due to the emergent 'entrepreneurial' role of universities whereby they can contribute directly to economic development through the commercialisation of university-based knowledge and technology through licences, spin out firms or joint ventures." The University of Ulster has long led the way in translating research for commercial use. The Office for Innovation has commercialized more technology than any other university in Ireland, built Northern Ireland’s largest academic consultancy business, secured the largest ever investment in a tech company and been recognized with several awards. Kristel, who has been appointed Lecturer in Management with Queen's University, Belfast, says that policy makers and technology transfer practitioners are interested in how knowledge from universities can be successfully transferred to industry. "The research investigated the multiple knowledge processes that take place between academics involved in technology transfer, technology transfer office staff and a local regional development agency in order to identify the key antecedents which facilitate or potentially impede University-Industry Technology commercialisation." Dr Sandra Moffett, senior lecturer in Computing at Magee campus who supervised the research said Kristel had been a first class student and an absolute joy to work with. "Kristel's research has been very positively received by both industry and academia. In the current knowledge economy, all organisations are interested in knowledge capture, share, dissemination and application. Kristel's work contributes to the field of Knowledge Management by considering knowledge share and transfer through an absorptive capacity lens."